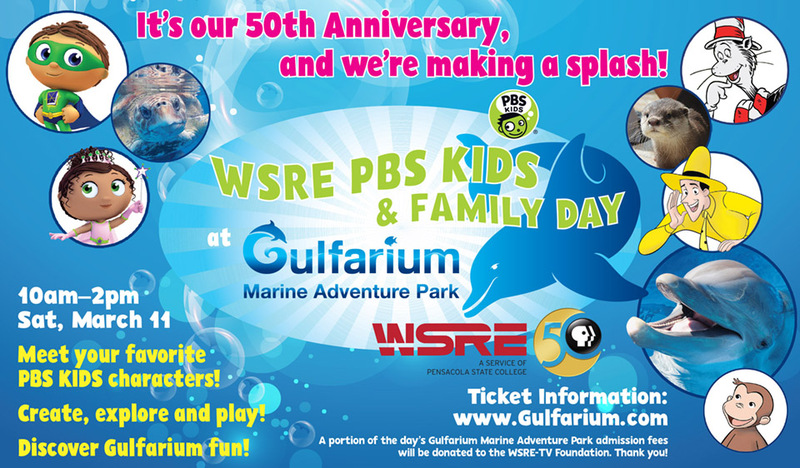 Join us for the third annual WSRE PBS KIDS and Family Day at Gulfarium Marine Adventure Park! Beloved characters from your favorite PBS KIDS shows like Curious George, Super Why! and The Cat in the Hat Knows a Lot About That will be at the park to greet young fans engaged in hands-on children’s activities including arts and crafts, a bounce house and scavenger hunt. In addition to PBS KIDS and Family Day, Gulfarium Marine Adventure Park will operate under regular park hours with their dolphin and sea lion shows, animal exhibits and aquariums. A portion of the proceeds from admission fees will benefit the WSRE-TV Foundation. Ticket and park information is available online at gulfarium.com. This event will be held rain or shine and is sponsored in part by Gulf Power Company, Cox Communications, Lamar Advertising, Cat Country 98.7 and NewsRadio 92.3 FM & 1620 AM, and Emerald Coast Magazine. at Gulfarium Marine Adventure Park in Fort Walton Beach on Okaloosa Island.